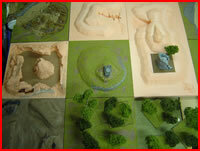 Battles are fought on modelled terrain tiles which incorporate buildings, natural features and foliage. A terrain tile is constructed with a MDF board which has floor grade styrene, 25mm thick, glued on top to form a base. Hills are formed by gluing more styrene on top of the original base, these are then shaped to form the structure of the hill. Squares are cut out of the styrene so that different tiles may be added to vary the terrain. Buildings are constructed by using a combination of plaster bricks, foam card, balsa wood and paper/card. Foliage is formed by using various flocks and static grasses sprinkled over different grades of wire wool, if these have been glued to realistic twigs to form trunks, then they will make excellent trees. All the terrain tiles, buildings and some of the foliage will need painting using acrylic paints to give natural life like colours. If treated with care the terrain tiles will last for years and will give hours of enjoyment.